Let’s be honest: We all say Halloween candy is for kids, but it’s hard not to reach for a piece — or seven — once it’s in your house. 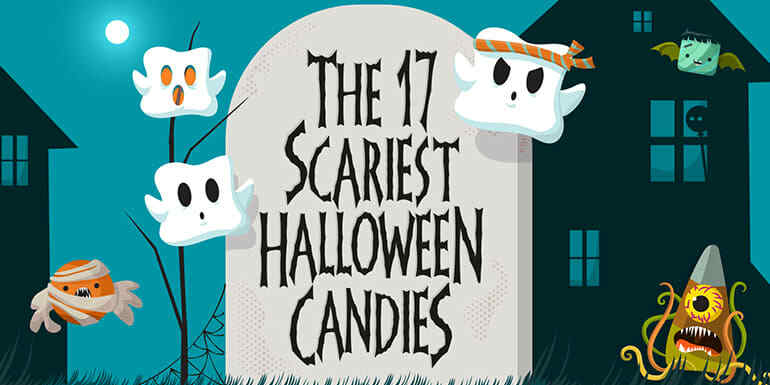 While we can’t come to your house and physically prevent you from housing the whole bag at once, we can offer you some tried-and-true tips to keep your candy binge in check. Buy candy for trick-or-treaters as close to Halloween night as you can. “Having treats in the house is a huge temptation and can cost you extra money if you have to go buy more,” says Ann Marion Willis, a R.D. in Cape Breton, Nova Scotia. Willis also advises that you should “Buy less than you think you will need. This will help you avoid having leftovers hanging around the house. It’s better for you to run out of treats than to be left eating them yourself.” If you find that your Halloween candy bowl is still full as the night goes on, start handing out more candy to each costumed kiddo that rings your doorbell. They’ll be thrilled, and you’ll be saved. One simple way to prevent yourself from eating leftover candy is to buy stuff you don’t like, whether that’s candy corn, atomic fireballs, or Good & Plenty. “Buying what you don’t like will make you less likely to indulge and reduce the urge you have to sample treats as you hand them out on Halloween,” says Willis. It’s not that I want to be cruel to others by feeding them waxy candy corn. Some kids love it. I just know I won’t eat a single piece. Sugar cravings can strike when you’re hungry and haven’t consumed enough fuel to keep your blood sugar in balance. Eat protein and fiber-rich meals in the days before and after Halloween, advises Willis. It’ll make you feel less tempted to create a dinner out of mini candy bars. Mindless eating is a good way to eat way more than you mean to — whether that’s nuts, chips, or candy. Rather than sitting in from of your TV munching your way through a bag of chocolate, try mindful eating. Select the one piece of candy that you most want to eat. Tune out all other distractions and focus on savoring the experience of eating it. Chew slowly, let it melt in your mouth, enjoy the the sweetness, and notice how it makes you feel. Cutting that piece of candy into smaller pieces will make the experience last longer, and may even make you feel like you’re eating more. Make your piece of candy go even further by chopping it into tiny pieces and sprinkling the bits on top of plain Greek yogurt. I’ve had adult braces for months and my candy consumption — especially the chewy, sticky stuff like caramels and gummy bears — has drastically decreased. Installing orthodontic hardware just to avoid eating candy is a pretty drastic solution, but brushing your teeth can be a similar deterrent. When you get the urge to unwrap handfuls of Halloween loot, give your pearly whites a quick brushing and see if that curbs it. Some dentists now offer to buy candy off kids in exchange for cash. This way they get a little spending money and you’ll get that calorie-filled temptation out of your house and mind. 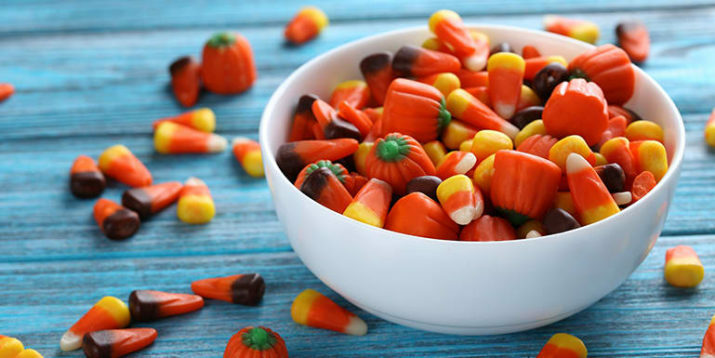 Everywhere you turn, there are bowls of Halloween candy that are full of spooky ingredients like sugar, fat, chocolate, soy lecithin, polyglycerol polyricinoleate, sodium metabisulfate, resinous glaze, and carnauba wax — yum! OK, let’s be honest — a list of sketchy ingredients isn’t going to stop anyone from hoovering a handful of [insert favorite Halloween candy here]. We’re not here to rain on your candy parade; you can still enjoy the scary good sweet stuff — if you eat them in moderation and if you know which ones you really should avoid (or eat less of). Use this guide to tally up your sugary treats and don’t let the “fun-size” options fool you: They may be smaller, but the calories, fat, and sugar content still pack a significant punch. For reference, when it comes to added sugars, the American Heart Association recommends no more than six teaspoons (25 grams) for women and kids aged 2 to 18, and no more than nine teaspoons (36 grams) for men. Per day. Ingredients: Sugar, corn syrup, partially hydrogenated palm oil, whey (milk), cocoa; malted milk (barley malt; wheat flour; milk; salt; sodium bicarbonate), resinous glaze, sorbitan tristearate, lecithin, salt, natural & artificial flavors, calcium carbonate, tapioca dextrin. Ingredients: Milk chocolate (sugar, cocoa butter, skim milk, chocolate, lactose, milkfat, soy lecithin, artificial flavor), corn syrup, sugar, hydrogenated palm kernel oil, skim milk, less than 2 percent milkfat, cocoa powder processed w/alkali, malted barley, lactose, salt, egg whites, chocolate, artificial flavor. Ingredients: Milk chocolate, sugar, cornstarch, less than 1 percent: corn syrup, dextrin, coloring (includes blue 1 lake, yellow 6, red 40, yellow 5, blue 1, red 40 lake, blue 2 lake, yellow 6 lake, yellow 5 lake, blue 2), gum acacia. Ingredients: Sugar, vegetable oil, nonfat milk, corn syrup solids, enriched wheat flour, lactose, 2 percent or less of cocoa, whey high fructose corn syrup, chocolate, lecithin, baking soda, salt, natural flavor and artificial flavor, tocopherols, PGPR (polyglycerol polyricinoleate, a compound that reduces viscosity). Ingredients: Sugar, wheat flour, nonfat milk, cocoa butter, chocolate, palm kernel oil, lactose, milk fat, contains 2 percent or less of: soy lecithin, PGPR, yeast, vanillin, artificial flavor, salt, sodium bicarbonate. Ingredients: Milk chocolate, peanuts, corn syrup, sugar, milkfat, skim milk, partially hydrogenated soybean oil, lactose, salt, egg whites, chocolate, artificial flavor. Ingredients: Milk chocolate (cocoa butter, chocolate, skim milk, lactose, milkfat, soy lecithin, PGPR, artificial flavors), sugar, enriched wheat flour, palm oil, corn syrup, skim milk, dextrose, less than 2 percent of food starch-modified, salt, cocoa powder, baking soda, soy lecithin, artificial flavor. Ingredients: corn syrup, milk chocolate, coconut, sugar, almonds, 2 percent or less of vegetable oil, cocoa, whey, salt, hydrolyzed milk protein, lecithin, sodium metabisulfite. Ingredients: Corn syrup, sugar, ground roasted peanuts, hydrogenated palm kernel oil, cocoa, molasses, and less than 1 percent of dairy product solids, confectioner’s corn flakes, nonfat milk, salt, soy lecithin, soybean oil, cornstarch, natural flavors, TBHQ (tertiary butylhydroquinone, a preservative) and citric acid (to preserve freshness), annatto color. Ingredients: Milk chocolate (sugar, cocoa butter, chocolate, nonfat milk, milk fat, corn syrup solids, soy lecithin, PGPR, emulsifier), peanuts, sugar, dextrose, salt, TBHQ. Straight sugar candies are mostly made with sugar, sugar, and more sugar, and dressed up with artificial flavors and dyes. These types of candy provide a quick sugar rush since they’re uninhibited by fat or protein, which can slow down their digestion. Ingredients: Dextrose, citric acid, calcium stearate, natural and artificial flavor, color (red 40 lake, yellow 5 lake, yellow 6 lake, blue 2 lake). Ingredients: Corn syrup sugar, microencapsulated malic acid (malic acid, hydrogenated palm oil), citric acid, gum acacia, deproteinized soybean oil, ascorbic acid, artificial flavors, carnauba wax, corn starch, blue 1, red 40, yellow 5. Ingredients: Sugar, invert sugar, corn syrup, modified cornstarch, tartaric acid, citric acid, natural and artificial flavoring, yellow 6, red 40, yellow 5, blue 1. Ingredients: Sugar, corn syrup, maltodextrin, dextrose, modified food starch (corn), partially hydrogenated soybean oil, less than 2 percent of: citric acid, water, artificial flavors, artificial colors, red 40, blue 1, yellow 6, yellow 5. Ingredients: Sugar, corn syrup, palm oil, skim milk, heavy cream, malic acid, whey, salt, artificial flavors, sodium caseinate, soy lecithin, artificial color (includes FD&C blue 1, FD&C red 40), turmeric coloring. Ingredients: Sugar, hydrogenated palm kernel oil, less than 2 percent of: citric acid, tapioca dextrin, modified corn starch, natural & artificial flavors, colors (red 40 lake, titanium dioxide, red 40, yellow 5 lake, yellow 5, yellow 6 lake, yellow 6, blue 2 lake, blue 1, sodium citrate, carnauba wax. Ingredients: Sugar, corn syrup, confectioner’s glaze (shellac), salt, dextrose, gelatin, sesame oil, artificial flavor, honey, yellow 6, yellow 5, red 3. Dr. Phil Shares: Does Yoga Work for Shedding the Pounds? While there are some styles of yoga that can help one burn more than 500 calories per hour — such as Vinyasa (see below) — overall, yoga doesn’t top the list of calorie-torching weight loss workouts one can do to see relatively quick results. But research shows that practicing yoga may work for weight loss when combined with a healthy diet. And the more often you practice yoga, the greater the results you’re likely to see on the scale. In a massive study of more than 15,000 adults, those who had been practicing yoga for at least four years clocked in at a lower weight than those who went without a regular session. But you don’t have to have do yoga for years to see results. A small study from South Korean researchers found obese women who practiced yoga for 16 weeks saw significant improvements in body weight, body fat percentage, BMI, waist circumference, and visceral fat compared to those who didn’t exercise. In addition, one study published in the Journal of Alternative and Complementary Medicine showed that a short-term yoga program could reduce weight in overweight and obese men. So how can yoga help you lose weight? Read on. However, a small study from the University of Wisconsin-La Crosse found that yoga students in a non-heated yoga class showed the same increase in core temperature and heart rate than in a hot yoga class. Researchers found that the students’ perceived effort was higher than what their vital signs revealed, leading scientists to wonder whether students didn’t end up pushing themselves as hard during some poses to compensate for the added heat and humidity in the room. Another study from the Journal of Bodywork and Movement Therapies found 30 minutes of just sun salutations is invigorating enough to qualify as cardiorespiratory training, and helps a 130-pound person burn an average of 230 calories. These studies point to the idea that your final caloric burn is tied more closely to how hard you’re working than how hot the room is. As mentioned previously, the style of yoga you perform can play a significant role in the amount of calories you burn. But other factors such as your weight, gender, body composition, and effort level are also important. What follows are averages based on the Health Status calories burned calculator. OK, so should you do the most intense yoga possible if you want to lose weight? Not so fast. Even super mellow methods have their weight-loss perks. A small study at the University of California, San Diego, found that overweight women who practiced restorative yoga, which focuses less on increased heart rate and more on relaxation and stress reduction, lost around three pounds and about five inches of subcutaneous fat after six months. This may surprise you, but it makes sense to the experts. 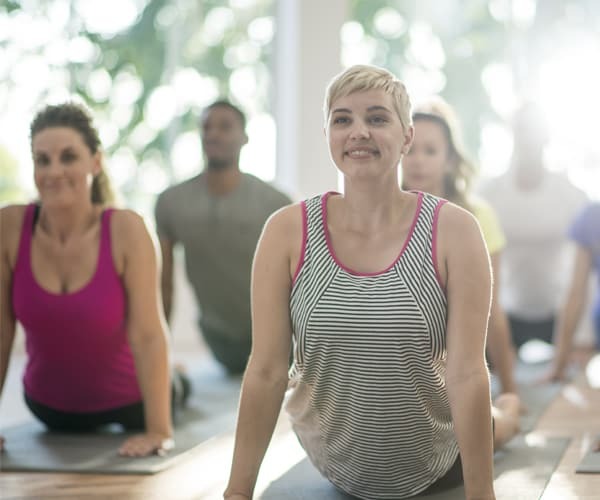 “If you’re super stressed, your body may actually respond better to yoga than [high intensity] cardio,” says Pete McCall, C.S.C.S., personal trainer and adjunct faculty of exercise science at San Diego Mesa College. Physical stress (as triggered by high intensity exercise) and psychological stress (caused by work, family, etc.) both activate the sympathetic nervous system, which controls the “fight or flight” response. When you go into “fight or flight” mode, your body increases its production of the hormone cortisol. In the short term, that’s a good thing; cortisol is a performance enhancer, increasing the concentration of glucose (your body’s primary fuel source) in the blood. But if levels never return to normal (e.g., because of chronic stress), cortisol can also promote weight gain. That’s why doing high intensity workouts might hamper weight loss efforts if you’re already (and chronically) “super stressed”—you’re layering stress on top of stress, and cortisol on top of cortisol. Plus, more than half of people who do yoga report that it helps them sleep better, according to a survey from the National Center for Complementary and Integrative Health. Scoring less than five hours a night is directly related to more abdominal fat and an increase in body mass index, according to a study performed over five years on adults younger than 40 and published in the journal SLEEP. It’s hard to deny the importance of sleep — not just for your quality of life but also for weight loss. “The greatest benefit of yoga for weight loss is learning how to love and care for yourself more, which helps you make better lifestyle decisions when it comes to caring for your body,” says Kaufmann. And the research agrees: A study in Qualitative Health Research found that practicing yoga helped people develop physical self-empowerment, and better awareness of the self and the present moment. 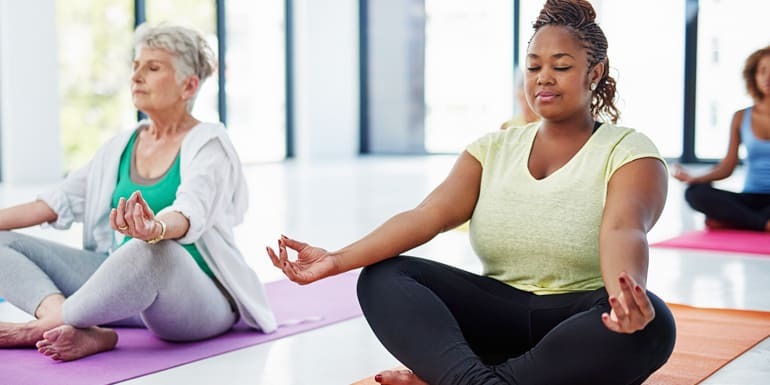 The women who participated in the 12-week yoga treatment program for binge eating (in the study mentioned above) reported an overall reduction in the quantity of food consumed, decreased eating speed, and an improvement in food choices. To most Westerners, yoga is more often associated with trendy fitness studios. But the practice originally began as a philosophy in India roughly 5,000 years ago, and incorporates so much more than merely the postures and poses it’s famous for today. The true practice of yoga encompasses eight limbs: the yamas (restraints), niyamas (observances), asanas (postures), pranayama (breathing), pratyahara (withdrawal of senses), dharana (concentration), dhyani (meditation), and samadhi (absorption). It’s the combination of all eight of those limbs (not just the one that stretches the limbs) that can lead to weight loss for men and women. “There are many studies that suggest that stress and the hyper-palatable food supply filled with refined carbohydrates create an internal biochemistry that activates the amygdala of the brain and make us less thoughtful choice-makers,” explains Annie B. Kay, RDN, E-RYT 500 registered yoga instructor, and lead nutritionist at Kripalu Center for Yoga & Health. “Yoga helps reduce stress as well as provides movement, which helps change that internal biochemistry to one that supports a more balanced brain activation (the cerebral cortex or executive function), which makes us better choice makers. Yoga is a path toward a deep self-discovery, and the practice not only helps unearth the difference between physical and emotional hunger for those who practice, but it also stretches the mind and body in new ways to open students up for more active lifestyles. Because yoga operates on so many levels (physical, mental, emotional), it has a way of making following an overall healthful lifestyle more easily attainable. If you’d like to give yoga a try, check out the 5-Day Yoga Body Challenge to burn calories while you stretch, or try 3 Week Yoga Retreat to learn the fundamentals of yoga. Dr. Phil Shares: Static Stretching vs. Dynamic Stretching: Which Should You Do? One of the biggest mistakes newcomers to fitness can make is skipping warm-up exercises before a workout. Not only is warming up valuable, it’s essential, delivering benefits beyond simply preparing your body for exercise, and extending to issues of safety and performance. But older notions of the warm-up may compromise both, making it important to know the difference between active and passive warm-ups, static and dynamic stretching. Once you’ve settled on a workout program, budget properly for some warm-up exercises by incorporating the information below into your fitness regimen. When preparing to do any type of vigorous activity — be it playing a team sport, performing aerobic exercise, or lifting weights — you need to prepare your muscles for action. Traditionally, there have been two primary ways to do that: static stretching and active warm-up exercises. This is what you probably did in your middle school P.E. class: gradually elongating a muscle and holding it for up to 30 seconds. Think side bends or the classic hamstring stretch, where you reach for your toes while sitting on the floor. The goal of these stretches is to release tension, making muscles more pliable and less susceptible to pulls and strains. Part of the larger category of active warm-ups, this type of preparatory activity involves movement-based stretching like bodyweight lunges and trunk rotations. Additional active warm-ups include sport-specific agility drills, sprints and shuttle runs, jumping rope, jogging, and other low-impact, light effort exercises. The goal is to prime the body for action, and it’s what smart trainers and coaches now recommend that people do not only before competition, but also before every workout. Research has found that while static stretching can provide recovery benefits when performed at the end of a workout, it can hamper performance if performed at the beginning. That’s because it relaxes muscles, sapping strength, while reducing blood flow and decreasing central nervous system activity. Active warm-up exercises — especially those that involve dynamic stretching — have the opposite effect, boosting blood flow, activating the central nervous system, and enhancing strength, power, and range of motion. As a result, they offer a host of both immediate and long term benefits. A 2014 systematic review of 31 studies published in the British Journal of Sports Medicine found that active warm-ups encompassing such exercises as sprints and plyometrics can enhance power and strength performance. Meanwhile shorter, static stretching not only fails to provide such a boost, but may also reduce strength. A meta-analysis of 32 studies on warming up and performance in 2010 also found that doing an active warm-up before engaging in sports yields improved performance — in this case, by 79 percent across all criteria examined. Even if you aren’t playing a sport every week — or competing in two running events in a single day — doing some dynamic stretching every time you lace up for exercise can help optimize your performance and fast track your results. It doesn’t matter whether you’re exercising in your living room, pumping iron in the gym, pounding the pavement, or hitting the links with your bros on a Sunday — priming your body for action will elevate your game and accelerate your gains. A 2008 study of roughly 2,000 soccer players in The BMJ found that a structured warm-up program that included running, jumping, dynamic stretching, and targeted exercises for strength, balance, core stability, and hip and knee durability decreased the overall risk of injury by 35 percent, and cut severe injuries by almost half. Scientists at Northwestern University had similar results in their 2011 study of 1,500 athletes. They found that 20 minutes of strength, balance, plyometric, and other dynamic stretching exercises before practice yielded a 65 percent reduction in gradual-onset injuries, a 56 percent reduction in acute non-contact injuries, and a 66 percent reduction in non-contact ankle sprains. More recently, a 2014 review of studies published in Orthopaedic Nursing found that tailoring a warm-up to a specific sport led to the fewest injuries and best outcomes. Although a sport-specific warm-up is always preferable, the following dynamic stretching circuit encompassing a broad range of movements can help prepare your body for just about any athletic endeavor. Perform each move for one minute prior to working out or competing. Stand tall with your shoulders relaxed and your arms by your sides. Slowly roll your shoulders in a circle (forward, up, back, down) for 30 seconds. Stand tall with your feet hip-width apart and your knees slightly bent. Keeping your back straight (not arched), raise your arms straight out to your sides, and bend at the elbows. Keeping your knees bent, pivot on the ball of your right foot as you rotate your torso to the left and invert the motion to the right. Stand on one leg and raise the opposite knee to 90 degrees (your thigh should be parallel to the ground). Keeping your knee raised, open your hip, making wide circles with your leg. Continue for 30 seconds. Stand tall with your feet together and your arms out to your sides or gripping a stable surface for balance. Shift your weight to your left leg and raise your right leg out to your side. Swing your right leg parallel with your shoulders back and forth in front of your left leg. Continue for 30 seconds. Switch legs and repeat. Stand tall with your feet hip-width apart and your hands on your hips. Pause, and then reverse the movement to return to the starting position. Repeat, this time stepping forward with your left foot. Continue alternating legs. Stand tall with your arms by your sides and your feet hip- to shoulder-width apart. Keeping your back flat and core braced, raise your arms straight out in front of you as you push your hips back, bend your knees, and lower your body until your thighs are parallel to the ground. Pause, and then push yourself back up to the starting position. Slow to move, can’t get up out of the chair, or have pain or stiffness in the hip when walking? You may have one of these six hip concerns. What causes pain in the hip? What can be done about hip pain? Bursitis: Bursae are jelly-like sacs that provide cushion between tissues such as bone, muscles, and tendons. Sometimes bursae get irritated with repetitive activities that overwork the joint. Inflamed bursae are very painful. Classic symptoms are pain when rising from a chair and pain down the front of the thigh. Homeopathy, acupuncture topical ligaments and anti-inflammatories may all be helpful. Tendinitis may be in just one side of the body, or both. Tendons are thick bands of tissue that attach muscles to bones. Exercising too hard without a proper warm up, or overuse of the joint can lead to pain and immobility. It is important to have the concern addressed as soon as possible to prevent long term mobility issues from the scar tissue from build up. Tissue work, natural anti-inflammatories and acupuncture can be very helpful. Osteoarthritis (OA) doesn’t have to be a right of passage of aging. There are things that can be done to slow the wear and tear on the joint and actually help restore the proper function of the cartilage that cushions your hip bones. OA can happen on just one side of the body in one joint. Treatment is longer term and can involve diet and lifestyle adjustments and possibly some supplementation. Rheumatoid Arthritis (RA) is an autoimmune condition. This means that the body is attacking its own tissues. Classic symptoms are worse in morning on rising and better with movement. RA usually happens equally on both sides of the body. One way it can be diagnosed is with blood work to see if there is a rise in the RF (Rheumatoid Factor). Anti-inflammatories will be helpful, but it is important to address the root cause of the autoimmune condition, and this often begins in the gastrointestinal tract. Naturopathic medicine is fantastic for getting to the root cause of an issue. Ankylosing Spondylitis (AS) is another autoimmune condition. Ankylosing means fusing and spondylitis means inflammation of the spine. Symptoms include a stiff, inflexible and painful spine and/ or hip area. In AS, ligaments and tendons as well as the bones are damaged. New bone is often formed in response which is thin and fragile and may grow together. Diagnostics include ANA blood factor and HLA_B27 genetic testing. Acupuncture and botanical medicines can be very helpful to reduce the immune system response in tissue, reduce inflammation and maintain strength and mobility. Systemic Lupus Erythematous (SLE). The classic presentation is a triad of fever, joint pain, and facial butterfly type rash in a woman of childbearing age should prompt investigation into the diagnosis of SLE. Since SLE is an autoimmune disease affecting many different tissues, something the symptoms can be body wide and unique for the individual, but one of the most common reasons at first is joint pain, including the hip. Diagnostics for SLE involve multiple factors; more information may be found here. As many factors in SLE present, the naturopathic doctor can piece together the picture and begin the process based on clinical presentation and blood work. Many factors in natural medicine can reduce symptoms of SLE.